As a fan of Haruki Murakami’s works, I was looking forward to reading ‘Kafka on the Shore’, a copy of which I had bought months ago but for some reason was still sitting on its self. And thanks to a community read-along, I had the chance to finally read it. My feelings about this book are, in fact, kind of mixed. When I started reading it, I found myself hooked. I loved Murakami’s writing style, and as some of his previous novels that I had read, the plot was simple and realistic, not giving the reader much to think about initially. There were some boring parts, alright, but I was pretty satisfied with it. However, there were some pretty disturbing parts in the story. And me being weak-hearted and intolerant of some certain displays didn’t help at all. The story itself has quite a few ‘supernatural’ elements, or rather, quite a few elements that transcend reality and conventional storytelling. I was kind of confused about these parts at first (the incident about raining leeches, for example, even though it was never really fully explained) but as the story progressed, I came to realise that the events themselves weren’t the vital part of the story, but what came out of them. Therefore, there were many (peculiar) incidents that occured but were never given an explanation why or how they came to be. But given Murakami’s tendency to confuse dream and reality in his writings, this may have been how he wanted it to be. Or maybe he decided to leave some things up to the reader’s imagination. Which worked quite fine for me, actually. Despite the disturbing scenes and the certain unexplainable events, I loved how wise, coming from Murakami once again, this book was. It was filled with the character’s uncertainties, insecurities and constant facing of dead-ends at certain points in their lives. Feelings we encounter all the time during our lives. The advice given, the wise words of the characters and the eventual determination to go on despite the hurdles that may occur in one’s life, made me fall in love with this book. It made me realise I should try harder if I want to change some things around me, and that I should accept everything that happens because they are what made me myself. 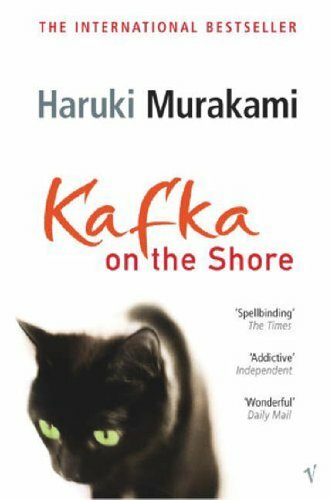 All in all, ‘Kafka on the Shore’ is definitely not Murakami’s best book. It may not be everyone’s cup of tea, either. But still, it contains these elements that make you think about your own life and where you’re headed. And even if you’re pretty sceptical about this book at first, somehow, it manages to win you over. Fabulous review, Akylina! This sounds like such a fascinating book, despite the horrid and odd situations which happen within it. I’ve found the same thing happening in quite a few Japanese books – perhaps it’s just the style they all subscribe to, to shock the reader whilst still producing something beautiful. Oh, definitely! I’ve not forgotten a Japanese book which I’ve read to date yet! I find them all so unsettling, but I really do enjoy them! I’ve read several Murakami novels (not this one though) and have enjoyed them all in spite of their weird and disturbing parts. Huge fan of his short stories as well, and just today I downloaded his brand new release. Have you read his newest novel yet, Jay? I’d love to hear your thoughts on it, since I won’t be able to read it for a few months ahead. I too saw many people calling it ”not the best book of Murakami”! From what you wrote,I gather that it is still a good book.Thus when I will finally start reading Murakami I might begin with this one and finish with Norwegian Wood! I was really skeptical about this book, exactly because I had heard so many contradictory opinions about it. It certainly is an interesting book, and even if you end up not liking it, I’m sure it will make you think of a lot of things. I’m really glad my review encouraged you to pick this book up 🙂 I’m not really sure if it’s the best book to start with, but even if you don’t enjoy it as much, I would advise you to give Murakami another chance. “Norwegian Wood” is my favourite among Murakami’s books, so I strongly recommend it!